Out with the Graphics and in with the Bold Details, says Apparel News’ article “Fields’ Top Five T-Shirt Trends for Spring/Summer ’18“. Barbra Fields, world traveler and trend spotter of the apparel world, released a report in early October predicting some of the hot new styles in fashion and apparel. From these predictions, we have been able to put together a list on what will be the best tee features this coming season. Among a rise in floral patterned dresses, and the forecast that woven fabrics will out class knits when it comes to tees and tops, it seems that adorned apparel will be the most sought after commodity this coming season. Everything will be based on “feel good fashion” which, according to Vogue will result in clothing with room to move. Expect to see both large and small pearl trims along the necklines of junior tees. Heat-transferred onto fabric, these faux-pearl accents will mostly maintain a black & white color palette. 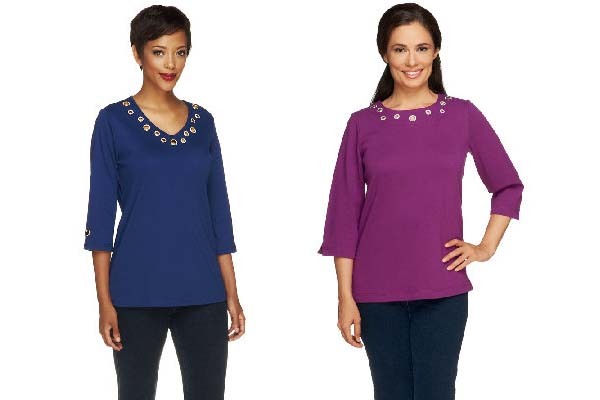 Creating a “starry night” feel, adorning graphics, and covering necklines, pearls add a touch of sparkle and class to classic tees. Yeah, we thought of ears at first too, but Fields forecasts that piercings will be featured along necklines, hems, and sleeves for 2018. Appearing in silver-tones, in various gauges, t-shirt piercings will be featured across necklines and the hems of sleeves. We are going to see femininity brought to basic tees this season by adding bows and ties along sleeves – accenting the shirt without having to becoming the center focus. In lace, mesh, and a myriad of other materials, bows and ties will become increasingly popular in 2018. When we think lace, we tend to picture a classic, feminine look. 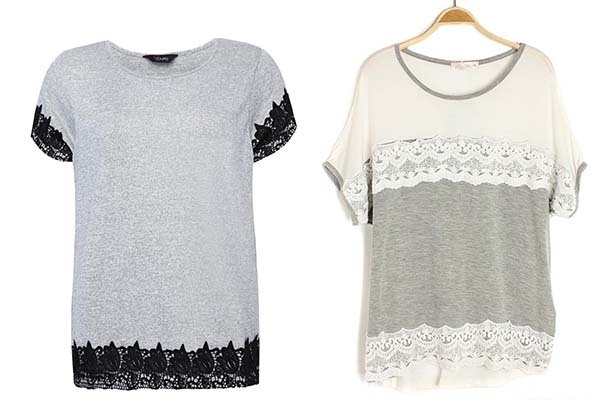 Gracing sleeves and hemlines of tees this coming year, lace is back in style (was it ever really out?). You may also find lace blended in with other trending trims. Used to create bows and ties, or accentuated by pearl decals. Keep an eye out, this resurfacing look will be taking on new and exciting forms in 2018. 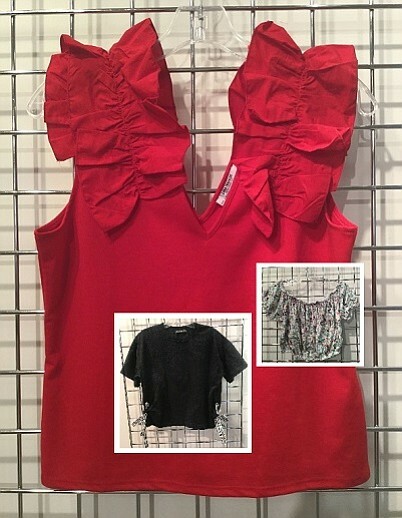 Ruffles will continue to be a trend this coming season. Mostly featured along necklines this year, the upcoming season will see them move to shoulders and around sleeves. Predominantly featured on woven tops in 2017, next season ruffles will be adorning more knitwear. We know, we said graphics are out, however, based on what’s trending on social media – graphics that remain will be more subtle and interwoven around bold trims. In 2018 fashion will be seeing more #girlpower slogans and fewer phrases about makeup and shoes. 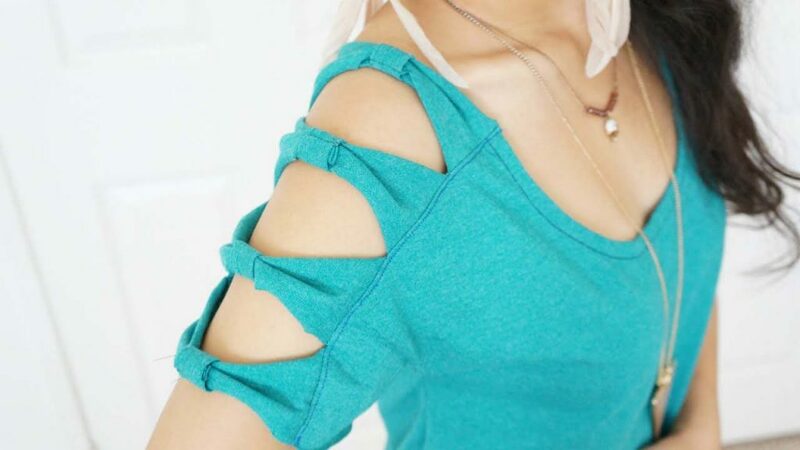 Keep an eye out for the continuation of the off the shoulder look this coming season. To create a bold new look, expect cutouts to be adorned by the trims featured above. The “peasant” top will be resurfacing this season in both long and short sleeved options. Apparel News reports that Fields forecasts a “wide variety of shapes in T-shirt silhouettes such as loose peasant blouse–style shapes, camisoles and tops featuring puff sleeves,” for 2018. Think mesh panels on woven fabrics . Cutouts becoming a little more creative with fishnet and other opaque materials filling in the gaps.